Our range of products include ms bow shackle, ss 304 bow shackle, ss d shackle, ms d shackle, ss bow shackle and ss 316 d-shackle. We are the prominent manufacturer and supplier of a broad array of MS Bow Shackle. These bow shackles are precisely manufactured by our talented workforce using finest grade material, at par with the market prevalent standard. We are giving these bow shackles in numerous sizes and dimensions, as per the requirements of our patrons. As well, patrons can avail these bow shackles from us in bulk order in quality packing within a given time frame. 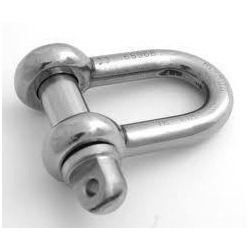 We are one of the distinguished Manufacturers of the best quality Stainless Steel 304 BOW-SHACKLES. Our BOW-SHACKLES are extensively used in oil field operations and vibration systems, etc. The BOW-SHACKLES offered by us, Are widely acknowledged for their quality finishing, Corrosion resistant and excellent dimensions. We are engaged in offering a comprehensive range of SS D Shackle. The offered shackle is accurately manufactured with superior quality material and latest techniques keeping in mind the set norms of industry. As well, a team of our quality controllers check this shackle to seek out any defect before supplying to patrons. We are providing this shackle in several customized options as per the needs of clientele. With the assistance of our team of professionals, we are engaged in providing an assorted range of MS D Shackle. These offered shackles are manufactured in fulfillment with the set quality norms by utilizing optimum quality material and latest techniques. Our shackles are acclaimed in the market owing to its fine finishing. We are providing these shackles in assorted dimensions & sizes details specified by clientele. We manufacture and supply a high quality range of SS Bow Shackle. The offered bow shackles are manufactured by top notch quality material and advanced techniques at our manufacturing unit. In addition, our bow shackles undergo various tests under the observation of quality experts, in order to make certain its excellence. Clientele can get these bow shackles from us, at nominal rates. We are one of the distinguished Manufacturers of the best quality Stainless Steel 316 D-SHACKLES. Our D-SHACKLES are extensively used in oil field operations and vibration systems, etc. The D-SHACKLES offered by us, Are widely acknowledged for their quality finishing, Corrosion resistant and excellent dimensions. 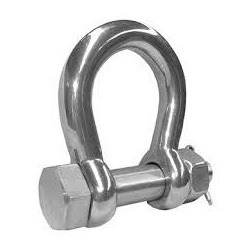 We are one of the distinguished Manufacturers of the best quality Stainless Steel 304 D-SHACKLES. Our D-SHACKLES are extensively used in oil field operations and vibration systems, etc. The D-SHACKLES offered by us, Are widely acknowledged for their quality finishing, Corrosion resistant and excellent dimensions. We are one of the distinguished Manufacturers of the best quality Stainless Steel 316 BOW-SHACKLES. Our BOW-SHACKLES are extensively used in oil field operations and vibration systems, etc. The BOW-SHACKLES offered by us, Are widely acknowledged for their quality finishing, Corrosion resistant and excellent dimensions. Looking for SS Shackle ?